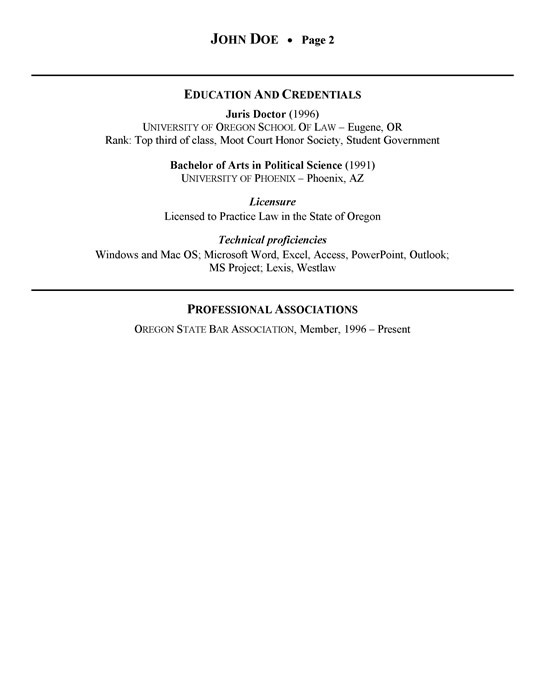 After the description you find a psoted example resume for a healthcare attorney. This lawyer had previous experience as Corporate Counsel and Managing Attorney. The resume begins with a vague job title of Attorney with subheadings of House Counsel and Corporate Counsel. 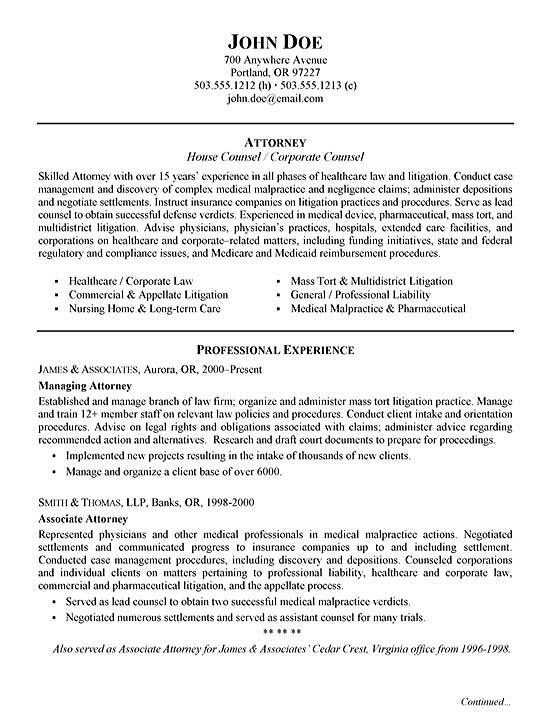 The resume uses an executive style summary to provide details of this attorney’s 15 years of experience. In the summary, the health care experience is obvious. It is also highlighted in the areas of expertise below which use bullet points as snapshot of their career strengths such as corporate law, commercial litigation, mass tort and professional liability. The professional experience section lists the law firm, the job title and dates employed. The paragraph describes the size of the firm and the scope of their employment. Bullet points highlight key actions and achievements. The education and credential section formally list the Juris Doctor Degree along with license to practice law in the state. Technical proficiencies and professional associations are also listed. Interpret, negotiate and draft health care provider agreements and service documentation. Review internal processes and policies for optimization and compliance to regulations. Design agreements and supporting documents for clinic services, retail pharmacy and special programs. Manage monthly regulatory filing requirements and maintain proper licensing authority. Provide legal advice and counseling on items related to contracts and business structuring. Advise board members on legal risks related to medical and pharmaceutical transactions. Counsel staff and department managers on employee issues, HIPPA, data privacy and government regulations. Represent health care company in legal matters including dispute resolution, arbitration and litigation. Collaborate with upper management, paralegal staff, human resources, workers compensation and third party attorneys.